The story begins with Nadia and her family moving to a new town. Her mother left, leaving Nadia to fend for herself in the world of magic, and now she needs her more than ever. New town is not all it seems and Nadia must do everything in her power to protect the people she loves. 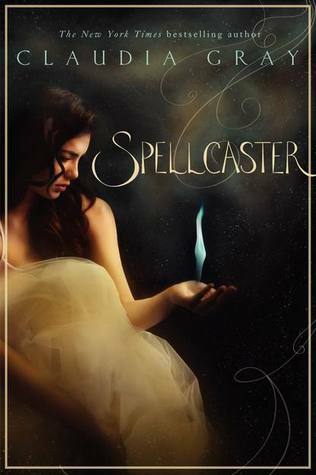 I’m a fan of Claudia Gray and I enjoyed Spellcaster and all the magic. Nadia was a good character that had to undergo some growing. I really liked seeing her love for her father and brother. I love when siblings get along in books, and especially when there’s an older sister protecting her younger brother. I liked Nadia’s relationship with her father as well. I really thought the family dynamic was good in the story and I enjoyed that aspect. The other characters in the story were interesting enough. Mateo, oh Mateo. He’s a sweetie for sure. I would like to see more of the romantic interactions between Nadia and Mateo, but I guess I’ll be satisfied for now. I liked seeing Mateo grow as a character and I’m looking forward to finding out more about them. I think my favorite part of the story was the unique way Ms Gray wrote the magic. Pitch Dark website posted a few of these rules and spells on their website and I couldn’t help but post them here. I loved the way the spells were written and executed. It was unique and beautiful. Overall, I really enjoyed the story and the characters. The world of magic was beautiful and poetic, the main characters lovable and sweet. I look forward to seeing where Ms Gray takes the story in the coming books. Spellcaster is out March 5th, 2013. Get it, read it, love it! GREATALADESOLUTIONTEMPLE is the right choice.